The Toyota Racing Development lineup is back for the 2019 model year. These high-performance vehicles are ready for the off-road with new equipment and refined performance features for drivers to enjoy. The full lineup includes three TRD Pro models. These are the 2019 Toyota Tundra TRD Pro, the 2019 Toyota Tacoma TRD Pro, and the 2019 Toyota 4Runner TRD Pro. These three models are designed to provide superior handling and performance so that you can tackle the rougher roads with ease. Alongside stunning performance, these vehicles offer drivers unique styling that accentuates the high-performance capabilities of these models. Built with muscular exteriors and striking features, these TRD Pro vehicles create a stunning sight. Drivers of these vehicles will enjoy soft-touch materials within the interior cabins and plenty of convenience amenities and covetable features alongside the impeccable performance that these models offer. Equipped with a long list of updates for the 2019 model year, the Tundra TRD Pro sees the addition of new Fox 2.5-inch front shocks and TRD-tuned springs. These new features lift the front of the vehicle by two inches and make traveling through rough terrain much easier. New fog lights and LED accent lights make this model look unique and give you greater visibility than previous model years. In addition, the Tundra TRD Pro offers a long list of additional features and updates that make this model even more powerful. This iteration of the Toyota 4Runner TRD Pro receives Fox shocks to enhance its off-road performance. These pieces of equipment are paired with TRD-tuned front springs that lift the vehicle an inch and provide an addition inch of wheel travel. 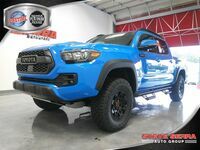 In addition, drivers of this model will find a ¼-inch-thick front skid plate and new red TRD lettering to protect the components of the vehicle and to give the 4Runner TRD Pro an added boost of athletic styling. 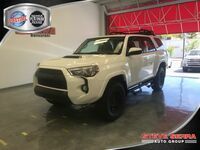 Like the other TRD Pro models, the 4Runner TRD Pro will be equipped with a variety of advantageous features in its interior and TRD-specific design elements. 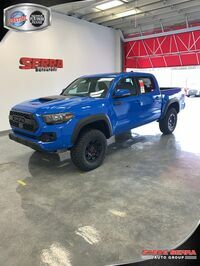 The 2019 Toyota Tacoma TRD Pro gets a number of updates for the new model year, but the biggest addition to the Tacoma TRD Pro is the TRD Desert Air Intake. This piece of performance equipment is designed to sustain consistent off-road performance by moving the air intake from the tire area where all of the debris and dust is present to the top of the vehicle where cleaner air is accessible. This helps to keep the engine healthier by allowing air ingestion to occur in a cleaner space. This benefits vehicle longevity and helps the Tacoma TRD Pro to perform better.